Classical formula for deficiency and/or stagnation of stomach. Symptoms include belching, bloating, poor digestion, abdominal fullness, indigestion, erratic or loose stools. Directions: For adults only. 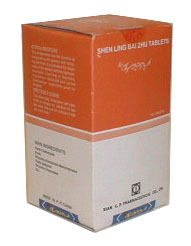 To be taken orally, 6-12 tablets each time, 2 times daily with warm water. *This product is recommended to be taken two hours apart from all other medications. Not suitable for pregnant women.